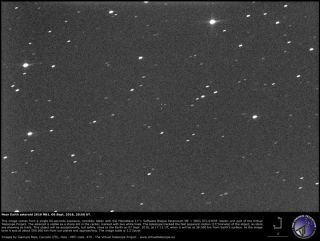 Asteroid 2016 RB1 imaged by Gianluca Masi, of the Virtual Telescope Project in Italy. The asteroid is a faint spot directly in the center; other brighter spots are stars. An asteroid the size of a school bus buzzed by Earth today (Sept. 7) in an exceptionally close — but safe — flyby. Scientists discovered the object on Monday, just two days before its encounter with Earth. The rock came particularly close to Earth's communication satellites, which orbit at an altitude of 22,300 miles (35,900 km). But there was no need for panic — scientists tracking the asteroid said there is no risk of impact, according to a report from EarthSky. Animation of Asteroid 2016 RB1 in motion on Tuesday (Sept. 6). Asteroid 2016 RB1 belongs to a group of space rocks called Atens. This group of near-Earth objects (NEOs) orbits the inner solar system, occasionally crossing paths with the orbits of the inner planets — Earth, Mars, Venus and Mercury.